Frederick "The Great" (1712-1786; the German Friedrich, second king of Prussia for almost half a century, from 1740 to 1786) is better known by repute. For his patronage of the arts generally, and love of the flute (and the flute music of Joachim Quantz in particular); and for support of C.P.E. Bach. So it's hard to know what to expect before listening to this CD on Hungaraton with three specialists of music from the period, Mary Oleskiewicz (transverse flute), Balázs Máté (cello) and David Schulenberg (harpsichord). In fact here is an hour and a quarter of original, varied, and beautiful small scale chamber music which marries grace, elegance and refinement to substantial (though never dense), vivacious and thoughtful melody, harmony and texture. It's also replete with surprises, depth and great individuality. The "Sonata 184" (G minor), for instance, starts with an unusually expressive arioso; it then builds up both pace and tension with two faster movements. But it somehow manages to infuse all three with both suspension and interest as well as changes of key and tone. The three players have a spontaneity that adds to our sense of hearing something fresh and for the first time (which will be the case for most listeners, surely). Their playing also has a dignity and gravitas making the music sound closer to that of Telemann or a Bach son. Each of the seven sonatas on this excellent CD has something new and inspiring, delightful or stimulating: a combination of instrumental color. As at the start (in the Grave movement) of the F Major Sonata, number 261 [tr.16], for example; the dour accompaniments of strings and keyboard to the flute says so much. Surely it proves that the flute too can be a serious (grave) instrument. And is confirmed by the other two movements. There is less weaving and spinning than construction and reflection. Upturns, ostinato/staccato passages appear to interject doubt, hesitation and faltering in the music's progress. One of the players' strengths is that they have re-appraised the timbres of the three instruments as much as tempi and dynamics to create color. The three lead the listener to a feeling that they are covering new ground thanks to nuance and subtlety in combination. The scores were edited and prepared from original 18th Century manuscripts by Oleskiewicz, who plays a transverse flue after Quantz with a1=385 Hz, Máté another modern cello after Stradivarius while Schulenberg's fortepiano is a reproduction of a Gottfried Silbermann. This particular combination of sounds is both rich and mellow… the various pizzicato, lower register and otherwise at times staccato moments (the third, Tempo giusto, movement of that same F Major (262) sonata [tr.18], for instance) bring an earthy and almost "raw" presence to the playing. This helps to assert the music's liveliness and novelty – in the best sense of the word; repeated listening always reveals something new and intriguing. Indeed, one senses that the players' have complete engagement with this music. Their response falls somewhere between one which would acknowledge the silver authority of Mozart and the smooth routine of Quantz himself. Perhaps this is the result of the equal weight that's given to each of the instruments, for all that Frederick was a flautist. The players individually and collectively respond to the joy which the composer seems to have taken in the balance between self-conscious Baroque taste and a line driven cleanly from start to end point: once the composer has said what he wanted to say, he stops and feels no temptation to say more. Very polished interpretations. Very burnished performances. Yet ones in which no varnish from the 21st century seems necessary. Satisfying in every way. 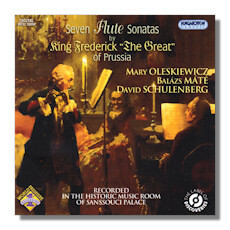 Significantly, this recording was made in the Music Room of the Sanssouci Palace, Frederick's favorite residence in Potsdam, where he is also buried. It's sharp, focused, clean and very favorable to every note and nuance without a hint of over-spaciousness, yet is sympathetic both to the instruments' individual timbres and the lusciousness and refinement of their sounds together. Oleskiewicz's notes in the booklet are exemplary in balancing background and context with the illumination necessary to enable the listener (specialist or not so prepared for the degree of satisfaction which both compositions and playing provide here) to get the most from this praiseworthy recital. This is one of the few releases in the current catalog devoted entirely to Frederick's music. All the more reason to investigate this one very closely: it has far more than curiosity value.